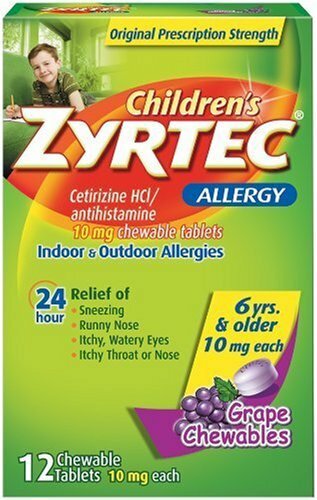 Best of 2013: WAL-ZYR versus ZYRTEC: Allergic to legislating trademark law? First published February 14, 2013. The Board sustained this Section 2(d) opposition to registration of the mark WAL-ZYR for ““pharmaceuticals, namely, allergy medications,” finding the mark likely to cause confusion with the previously-used mark ZYRTEC for allergy medications. It found ZYRTEC to be a strong mark, the goods identical, the channels of trade and classes of customers the same, the mark similar, and the purchasing decisions to be less than highly sophisticated. Walgreen’s survey evidence was deemed not sufficiently probative to affect the result. McNeil-PPC, Inc. v.Walgreen Co., Opposition No. 91184978 (January 22, 2013) [not precedential]. The purchasers of these over-the-counter products are “ordinary consumers with no special knowledge or expertise,” [the Board found,] and although they may spend time confirming the particular uses for the products, that does not mean they are immune from source or sponsorship confusion. So the Board found this factor to be neutral. 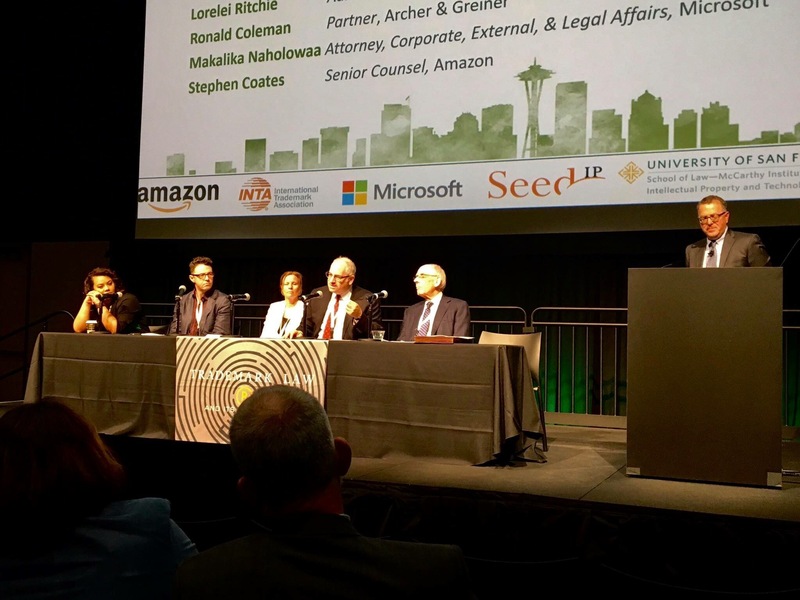 In short, the Board found that the similarities in appearance, sound, connotation and overall commercial impression outweigh the dissimilarities. As I have said before, I am fascinated with this topic. In this case, I find the Board’s ruling hard to understand. As many of the commenters to John’s posts acknowledge, these products are routinely placed side-by-side on the store shelves — an important consideration when considering generic knockoffs, as I discuss here. Given what’s really going on on those shelves, which is that these generic versions of every single pharmaceutical are juxtaposed against the famous version, making source confusion unlikely. Here’s what really bothers me: This is a Section 2(d) opposition. 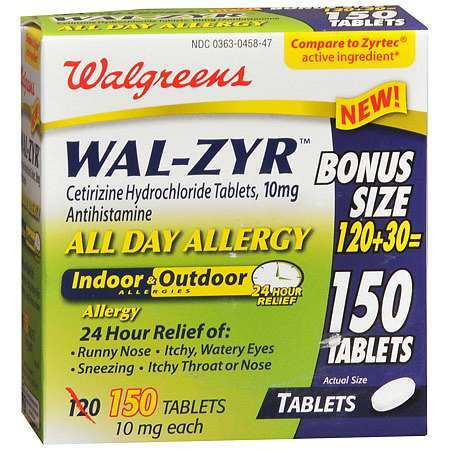 That means that Walgreens could not register the trademark WAL-ZYR because it is confusingly similar to the trademark ZYRTEC. As Kevin Grierson says in the comments at the TTABlog, “Here, with just a standard character mark . . . [I] don’t think Wal-Zyr and Zyrtec look or sound all that much alike.” They don’t, of course. This is not an infringement case involving trade dress. It was a question of whether the standard word mark WAL-ZYR is confusingly similar to the senior, registered ZYRTEC. Yes, they are identical products. Yes, they are sold in the same commercial channels. 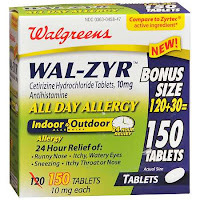 Yes, Walgreens clearly intended to to take advantage of the “ZYR” combination, which is a prominent part of the ZYRTEC mark. But ZYR is not a trademark itself. The WAL, moreover, comes first, and is also the dominant part of WAL-ZYR. When considering the similarity of two marks containing primarily disclaimed or descriptive components, the salience of the first word in the applicant’s mark “ given its position in the mark and its connection to the overall meaning of the mark “ cannot be dismissed. “It is not without significance that the first words of the marks differ.” Old Charter Distillery Co. v. Cont’l Distilling Corp., 174 F. Supp. 312, 321 (D. Del. 1959). See Boston Duck Tours, LP v. Super Duck Tours, LLC, 531 F.3d 1, 35 (1st Cir. 2008) (finding no confusion between BOSTON DUCK TOURS and SUPER DUCK TOURS; “Boston”and”Super” were descriptive, while the marks’ first words were “their most salient features”). And “the use of identical, even dominant, words in common does not automatically mean that two marks are similar. We may consider the marks’ visual, aural, and definitional attributes and compare the trade dress of the products in determining whether the total effect conveyed by the two marks is confusingly similar.” Sensient Technologies Corp. v. Sensory Effects Flavor Co., 613 F.3d 754, 764 (8th Cir. 2010), cert. denied, 131 S. Ct. 1603, 179 L. Ed. 2d 500 (U.S. 2011) (internal quotations and citations omitted). There was a good deal of argument in the briefs regarding the trade dress employed by both parties. However, for purposes of this factor we note that applicant seeks registration of a standard character word mark. Applicant’s standard character mark is not limited to any particular display, but can be used in any stylization, including that identical to opposer’s. I haven’t looked at the underlying papers but, presumably, depictions of the trade dress the parties were discussing were included. Can this really not have affected the Board’s decision? It says it didn’t, so, fine, it didn’t. We have to be careful, don’t we, when we talk about “official mayonnaise colors” or “official peanut butter colors.” Nothing in this opinion grants ZYRTEC “official antihistamene colors,” after all. And there is something else interesting going on, isn’t there? The “family of marks” business. It’s WAL — the fine “family” of WAL-marks Walgreens marks. The TTAB says, in the opinion, “Applicant’s asserted affirmative defense based on a family of marks, is not a recognized defense.” Well and good. I don’t like the concept, myself. But hasn’t the Board, really, essentially granted a franchise to Zyrtec in ZYR as a trademark all its own, a family name that no one else can use no matter how unconfusingly? I’m itching for more. John’s post, and the comments there, are a great start on the analysis. Really, though, the “more” should also include a look at the Lanham Act by Congress. Because there are probably no right answers to these questions. They are policy decisions, which should be legislated, not adjudicated. And bringing the Lanham Act into the 21st century is one allergy that no pill is going to cure.